I saw this video a few weeks ago, at first I was so moved by the ingenuity, creativity, and resourcefulness to turn rubbish into something so beautiful . And how such a "simple" idea can have such a profound effect on others lives. Also as I was watching this I began to think of the Kabalistic concept of Yesh Me-Ayin, or something from nothing. How our life and sustenance amounts to being created and continuously created from nothing. Just like taking discarded materials and turning that into a gorgeous symphony. And as discussed so much in Chasidic Philosophy melody is the language of the soul, and the soul is what drives humanity as well. Below the video is an excerpt from a book that I think explains the point so beautifully. When God created the world, what were His raw materials? What did He start with? The answer, of course, is nothing. The world came into being at some point, but before that, it was nothing. God was always Something even before He created the world, and will always be Something with or without a world; but the world, and everything in it, was once nothing. 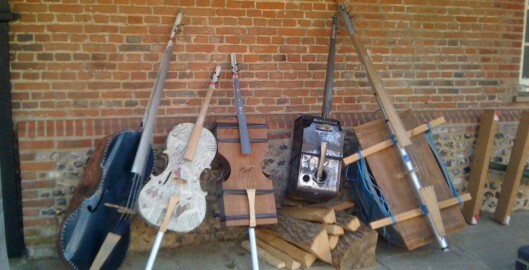 A sample of some of the instruments made from "nothing"
Human creativity is not real creation. As humans, we can change one something into another something. Whether we speak of the artist who turns paint and canvas into a masterpiece, or a builder who turns steel and glass into a skyscraper, we are talking about the manipulation of form, not the creation of new existence. Indeed, the First Law of Thermodynamics is that matter and energy cannot be created or destroyed; they can only be changed into different forms. Yet, if we believe that the universe has a beginning, we must say that God started by taking nothing and making it into something. In so doing, God did not just change the form of nothing. He overrode its very essence. The very definition of “nothing” is that it does not exist. By forcing nothing to be something, God made nothing be the very opposite of what it really is. Now, when we form one something into another, it usually keeps the shape we put it in. A loaf of bread isn’t going to disassemble itself back into flour and water. A plastic cup isn’t going to revert to petroleum. Why? Because for flour and water to be bread, and for petroleum to be a plastic cup, is no imposition at all upon the essence of flour and water or petroleum. Their essence hasn’t changed, only their form. When God turned nothing into something, He completely changed its essence. Every moment that nothing exists as a something is unnatural. Indeed, nothing would not even continue to be something unless it’s constantly being forced to do so, which is why we say that creation is necessarily an ongoing process. At any rate, if you exist, then you are a something. But that’s only because God is creating you that way at this instant. Your essence is to be nothing. Or, should we say, your true and natural state is to have no existence of your own, and to exist only as He exists, within the totality and oneness of God. If that’s the case, then it explains the mystery of why it can be painful just to exist. Our somethingness is not our true essence. Oneness is our true essence. Not that it bothers all of us equally. Some people can live with it. Some people can’t. Posted on August 26, 2013 by shlomo elkan.